Natalia Arbelaez is a Colombian-American artist, born and raised in Miami, Florida to immigrant parents. She is a figurative sculptor who works through themes of identity. She uses her histories, stories, and culture as a part of storytelling personal narratives. Natalia uses her work as a bridge to research the history and culture of Latin America while personally reconnecting and preserving. The use of the body plays an important part in her work as she uses her memories to extend to places beyond the body. She received her B.F.A. from Florida International University and her M.F.A. from The Ohio State University, where she received an Enrichment Fellowship. She completed a year-long residency at the Clay Art Center; Port Chester, New York as a Barbara Rittenberg Fellow and was awarded the 2016 Inaugural Artaxis Fellowship that funded a residency to the Watershed in Newcastle, Maine. Her work has been exhibited nationally, in museums, galleries, and included in various collections. She has been recognized by the National Council on Education for Ceramic Arts as a 2018 Emerging Artist in the field. Natalia has been accepted as the 2018–2019 resident artist at the Ceramics Program-Office for the Arts Harvard where she will continue her research of pre-Columbian histories and art. I was born in Miami, Florida but shortly after my birth, I immigrated to my mother’s country of Colombia, Medellin. I would return to the states at the age of four and assimilate quickly learning English and forgetting Spanish within a month. Throughout my life, I have always questioned my identity and have felt a sense of loss. With creating work, I could fill that loss and I have been able to reconnect with my heritage. My work serves as a bridge to research my history and culture while aiming to preserve. I look to the history of Latin American and Amerindian people and work with how these identities are lost through conquest, migration, and time, gained through family, culture, exploration, and passed down through tradition and genetic memory. I use these influences to contribute to a contemporary dialogue while simultaneously continuing the work of my ancestors. There has been so much loss and stigma of these communities that it is important to me that my work celebrates and honors them. The body plays an essential role in my work as it has a memory to it and memory extends itself to my ideas of the body. In my process of referencing the body, I have forgone the use of an actual and specific body. Because of this, I can use the memory of my own body, the body of my family, and ancestors to extend my memories to places beyond the body. In creating more of an essence of the body and not a likeness I am able to visit such personal and painful narratives that I find hard to confront. Hi Natalia! Did you begin making art at a young age? What are your most impactful memories of being exposed to art or art-making while growing up in Miami? One of my most impressionable moments in Art and clay was when I was about 5 my family and I were staying on a farm in Guatape, Colombia. It’s a small town that is centered around water reserves and that year the water had receded a lot. That year you could go hiking down into where the reserve was. I remember finding clay in the ground and just instinctively bringing it back to the farm with me to create. That same day I remember creating in clay with my family and letting things harden in the sun. When I moved back to the states I moved to a little town in the middle of CT. I didn’t speak English and school was very hard for me. I remember gravitating to art as a way to communicate. There were never any wrong answers in art and at the time it felt like the only thing I was good at. The most impactful memories of being exposed to art in Miami is from my mom. As a teenager she was friends with many artists and was dragging me to art shows since I was about 14. Seeing actual people create in their daily lives and just being around it made it feel attainable. What initially drew you to working in clay? I was always interested in creating the body and storytelling. Clay just felt very natural. I started as a painting major in undergrad and then moved to sculpture. I sometimes work in paper and glass but will always start in clay and then take molds off of it. I really like the way clay moves, how you can make it look like anything, and how inexpensive it is. Your work is largely driven by your own personal narratives, as well as your parents’ immigration from Medellin, Colombia to the US. How do issues surrounding identity, heritage, and Latin American histories inform meaning in your work? These personal narratives and histories form meaning in my work in a political climate that is telling me and people like me that we are less than. I don’t see my stories or people like me being celebrated in American history and culture. There’s a lot of shame and stigma surrounding Immigration. I want to celebrate and honor these stories and tell people that we also belong in American history. Most importantly I want to place value in these stories and people like me, I think that’s meaningful. What role does research have in your creative process? When using source material, do you typically work from photos or observation of the actual objects? Research plays a big role in my work. I have mostly worked off books and internet. I’m currently doing a residency at the ceramic program at Harvard University. With this residency I have access to Harvard’s museum, collections, and libraries. While I’ve been here I have been able to physically interact with the very objects that I have been studying through images or behind glass. You often return to references of Pre-Columbian artifacts throughout your work. Are there functional vessels or ceremonial objects that you’re specifically drawn to and why? I’m really drawn dawn to Colombian double spouted vessels. I’m drawn to these because they’re more specific to Colombia. I also look at a lot of Peruvian pottery. I just finished a series that was influenced by Moche ceremonial vessels. I’m really drawn to these object because of the importance and ritual aspect of the function but there’s also humor in these objects. Can you expand on your interest in gold funerary masks and the significance of gold more generally in Colombian history? Colombia had an abundance in gold. Unfortunately, most of the only objects that are left are funerary objects because the Spanish stole and melted what they found. My interest lay in how gold was valued compared to other materials. Gold had its symbolic hierarchy to its connection to the sun but wasn’t the most valued material. Many times, the gold would be covered in copper and other materials. A lot of the faces that I reference are these beautiful gold masks that were hammered out. These masks are crude with teeth exposed I imagine trying to frighten anyone that would disturb the resting place. That’s why many of my features are simplified with gold exposing teeth. You transitioned away from slip-casting in early work to building smaller scale figures with simplified forms. Can you tell us about this and the evolution of your body of work over time? When I first started working with the body I was trying to model a specific body using references. I would model a solid piece of clay and then take molds off the form. Because I was casting off the form it was rigid to make the process easier. I then eventually started to make clusters of these forms using slip casted pieces from my molds. These clusters would take weeks to construct and creating them was also a very rigid task. The work ended up becoming too precious and I couldn’t play or experiment to make sure the structure would be sound. This work made me move to the completely opposite direction. I started creating smaller pieces that didn’t reference a specific body, using more traditional methods like coil to loosen up, and started to have more fun and experiment. Even though representation of the body is simplified, your figures are also characterized by highly textured surfaces and exaggerated, cartoonish features—pronounced, red-lipped frowns, elongated noses, blemished complexions, and bloated abdomens. What inspires these decisions? These decisions are inspired from influences of pre-Columbian figures and contemporary cartoons. I also just want to exaggerate and simply at the same time. Most days when I’m in the studio what works is what is making me laugh that day. How does humor function in your work? And loss? I think humor functions in my work with allowing me to story tell such personal narratives and important histories. I don’t think I could handle the subject matter if I couldn’t make it fun and funny for myself. Most of the work is about loss and trying to reclaim that loss. I would say it’s a driving force in the work. Depictions of Mother and Child and identical (or mirror image) pairs appear frequently in your work. What is the importance of these recurring figures? This comes from the heavy influence of the Catholic Church in my life and culture. I often reference many different shrines looking at hierarchy, symbolism, syncretism, and symmetry. It’s with a combination of this and looking at fertility and maternity figures used in pre-Columbian work. These roles were once important to document and represent. I feel that people will often dismiss work made about this relationship. I wanted to highlight the importance it plays in my life. These figures are also often a self-portrait of my experience as a mother and my shortcomings. Recent works, like El Dorado, incorporate prominent mountain landscapes and terra cotta as the primary material. What prompted this shift in direction? Growing up in the US I have not been exposed to any Colombian history other than cartel related news. I wanted to research Colombian history and recreate it as a way to relive the history. El Dorado was the start to this work. Can you tell us about your current studio? What is an ideal day like for you? My studio is currently at the ceramics program at Harvard University. The studio and the community is beautiful. I’m in an open studio with about 14 other artists in my area. I usually come in make sarcastic jokes with my resident mate Colby Charpentier and make the rounds of saying hello. Then I get to work in my space. An ideal day would be when I could just get straight to the studio and work nonstop for 9–12 hours. With teaching, emails, and working on the computer I’m lucky if I can do that three days a week. Would you say your way of working is structured and repetitive, more intuitive, or a combination of both? Can you lend some insight into your process as a whole? The work can be repetitive and it’s evident from my surface. I like leaving the evidence of that repetition as a sort of self-portrait of my obsessiveness and my presence. Its structured because I’m very intentional about what’s going to happen but its intuitive in how the piece grows. I am very open to how the clay wants to move and how things will be more fun in the moment. I know you’ve attended several artist residencies, including Watershed, Belden Brick Factory, the Clay Art Center, and currently The Ceramics Program at Harvard. How do you usually approach your time at residencies and what effect have they had on your career overall? I try to be really open when approaching residencies. For the shorter ones I try to only bring with me my necessities and use what’s around me. I want to show up without a plan and let the new materials and environment bring new ideas. I also make time to enjoy the environment and other artists around me. I want to work hard but feel that it’s just as important to create meaningful experiences. Being at these residences has had a significant impact on my career. The friendships that I have created at all these places have all fostered incredible things. I have continued to participate, create shows, and continue dialogues because of these places. Since leaving Miami, you’ve lived and worked in smaller communities. What are the benefits of relocating to these places as an artist, as opposed to larger cities? Moving to these smaller communities has been good for space and limiting distractions. I think changing up environments is always good for influence and practice. Some of the culture shock and isolation has made me ask some bigger questions and look deeper into why I was feeling those things. It really fueled a lot of my content. 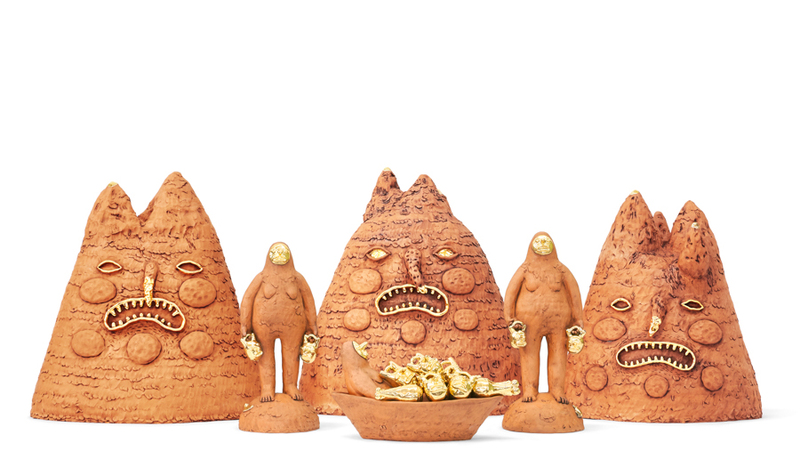 Who are some contemporary artists working in ceramics that you’re really excited about? What are you working on in the studio right now? Do you have any upcoming exhibitions, lectures, or other news? I’ll be talking at the CAA conference about Clay, Stories, and Identities on February 14 with some great artists I look up to; Roberto Lugo, Sharief Bay, and Patsy Cox, put together by Josh Green. I’ll be at NCECA demoing at the Makerspace Thursday March 28th. MAKERS’ SPACE: TRADITIONAL TECHNIQUES FOR UNTRADITIONAL FIGURES By Natalia Arbelaez Using traditional techniques like pinch and coil that is influenced by pre-Columbian technique and style to create zoomorphic contemporary figures. I’m also working on four shows for NCECA in Minneapolis MN. You Extra a show about Amaco crystalline glazes, Hybrid figures a show about flesh for fantasy, You am I a show about modern day identity, and Human Nature artist of color come together to celebrate the human form. To find out more about Natalia and her work, check our her website.